Even though I've been back from our trip to Baltimore for several days now, I still haven't gotten myself organized enough to get a post put together - that's what happens when you take WAY too many pictures! I promise to get to working on that soon but today I'm going to take a short drive over to Rhode Island and check out the Photo Show at the Courthouse Center for the Arts in West Kingston, Rhode Island. I'd like to take a look at the other pictures from the photo contest that I entered last month as well as see my very first photo displayed in a Photo Show. After that Amanda and I need to get some last minute things for her first day back at school tomorrow - as a Senior no less! - and then I guess I'll take her to lunch somewhere with my winnings from the Photo Contest. Kind of a first-day-of-September-last-day-of-summer thing. 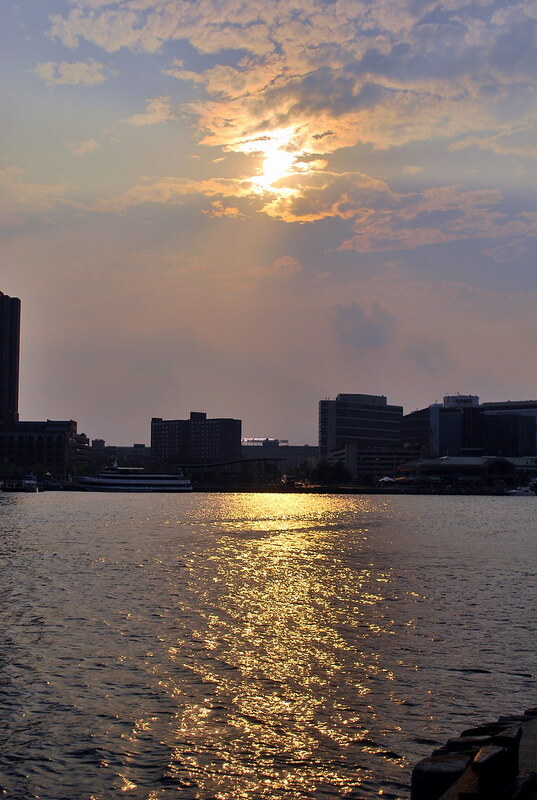 In the meantime, here's one shot I took at the Inner Harbor in Baltimore as the sun was starting to set on Thursday evening. Do we get pictures of your picture proudly on display?? I love this shot Linda. It's beautiful. You really do take some really outstanding shots. That's a lovely shot Linda. As a senior? Oh my... that just hit me. Tell her to make buddy buddy with the guidance counselor at school asap. She should start searching for scholarships. Trust me on this. There's tons of college opportunities out there, especially in the arts! Scholarships, interships, community service ... this is the year it all adds up. Beautiful photo. Sunsets are sooo soothing. Lois is right on. Don't miss out on good opportunities!